Hope you are having a great weekend. We are really a little stressed because of the leakage stuff going on in a flat below ours as I mentioned in the last post. It is hard to concentrate on the exams I have to prepare, sigh. But at times like this, I love turning my attention to pretty things so here is a Sunday post. I would like to start by writing that it is harder for me to blog about brands and products which I really love. I usually get worried about not doing them justice. 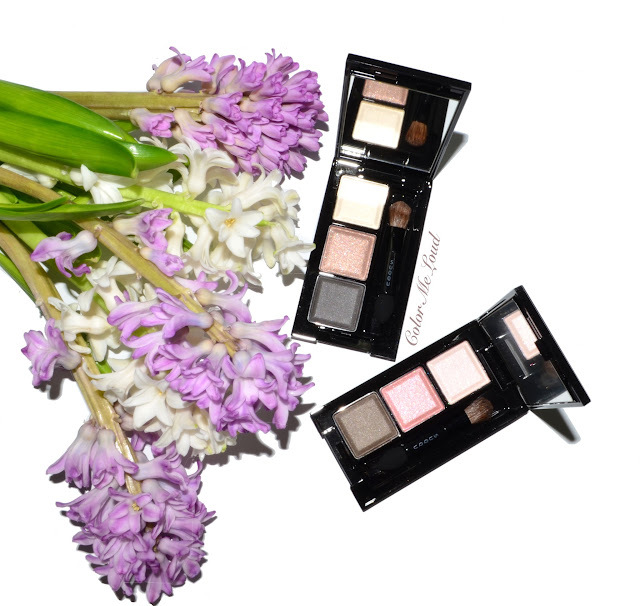 I am testing Suqqu Spring Collection for a month now but due to day light issues I was not able to make really pretty photos which reflects how gorgeous they look on the eyes. Another issue is that the Spring Collection consist of very soft shades which truly shine by how they reflect light and this is hard to capture. You can see Part 1 of my review here. Today I would like to share some swatches and looks with two limited edition Suqqu Eye Color Palettes, Ex-05 Sumichazumi & Ex-06 Hanamizuki. I am glad to see some YouTube videos which cover Suqqu make-up. I think Suqqu is a brand which deserves more attention because they deliver a consistent excellent quality. That said, I have seen that some need an introduction to the brand. For those who are not familiar to Suqqu, here are a few facts. Suqqu has two types of palettes, quads are called Blend Color Eyeshadow. These usually have three matte and satin finishes and a cream or powder base shade. Suqqu also has trios called Eye Color Palettes. The eyeshadows in Suqqu trios are usually more shimmer than the ones in their quads. Especially the top most pan has some sparkles. The "shimmer" doesn't look too much or over the top in any way. One of the claims of Suqqu, which I think they manage to deliver without a doubt, is that their make-up can be worn by all ages, including mature woman. Quads and trios are sometimes more pigmented, sometimes softer but the ones which are softly pigmented doesn't have the quality issues which we see in Western brands. In Japan women don't want to go too heavy with make-up so don't expect crazy colors for Suqqu. Their line delivers superb quality wearable eye shadows which blend like a dream, have great longevity and show great dimension on the eyes. If you have any questions about the brand, please leave a comment. I would definitely love to help you with that. I have been adoring their make-up since many years. There are two limited edition Eye Color Palettes for this year's Spring Collection. The limited edition products of Suqqu are always denoted by an "Ex-" in front. I think Western brands should apply this to their products as well since usually it is often being discussed if a product is limited edition or not and it is sometimes the case even PR doesn't know. 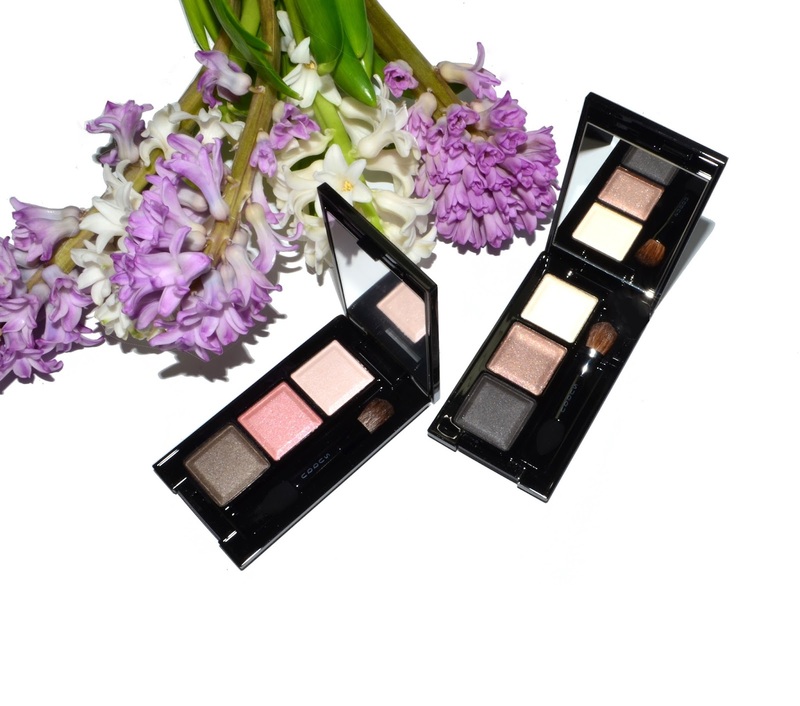 Suqqu Eye Color Palettes in this collection are inspired by the morning dew drops on fresh flowers. The first trio Ex-05 Sumichazumi, sumi 墨 (ink), cha 茶 (brown), 墨 (clear, pure) if hopefully I didn't make a mistake, consist of ivory shimmer/glitter (A), warm shimmery brown (B) and deep cool brown with a bluish tingle (C). Suqqu eyeshadows truly shine in how they layer so I also included a layered swatch. You can see that these shades become a super pretty khaki green once layered. My long time readers know, I have problems with pulling off some shades of warm browns and khakis. Unfortunately it is exactly the case with Ex-05 Sumichazumi. If I bring enough of Ivory, then it doesn't look muddy on me but too much of the top shade cause some fall out during the day on dry eyelids. I am sure though lots of people will love this color though, I know when I mentioned I can't pull off khaki many were disappointed in me ;-) I have given it a try below. Let me know what you think. Here is the look in context. I am wearing Suqqu Face Colour Palette Ex-04, the powder all over the face and blush on the cheeks. 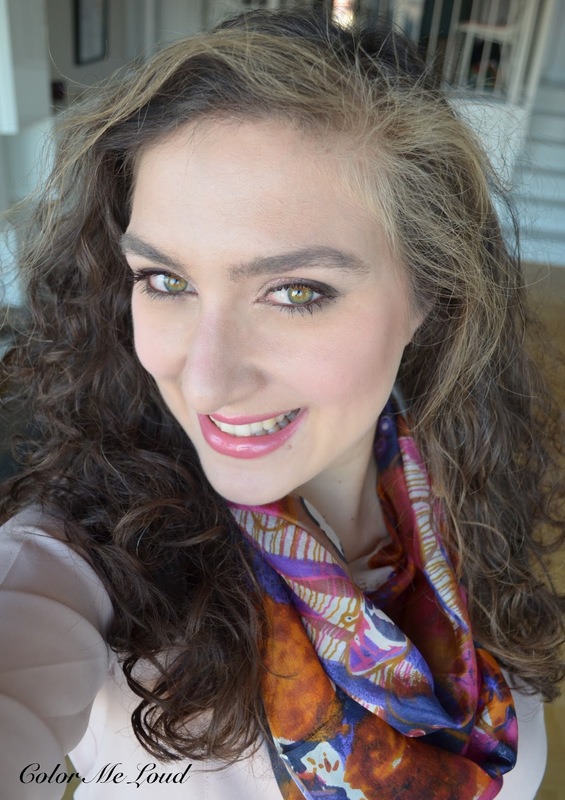 I combined this with Suqqu Bright Up Lipstick 08 Samidaidai from the Spring Collection, which I am loving. You can see the swatches in the previous post. And of course Eye Color Palettes Ex-05 Sumichazumi and Suqqu Gel Liner in Brown is on the eyes. By the way I used up my gel liner in brown, which shows how much I love it. The second limited edition trio from Suqqu Spring Collection is Ex-06 Hanamizuki (花瑞樹) is so pretty and feminine. The inspiration behind this palette is the harmony of pink and dewy green in Hanamizuki (English: dogwood) flowers. By the way while doing the research I have seen that there is also a romance drama movie by that name. This trio is so much love for me. The middle shade is such a pretty neutral pink which almost sings on my eye lids. The deepest shade has a green tingle which makes the pink pop. The top shade brings some more brightness and shine in the game. And even better, once layered these become the pretties taupe with a hint of purple. I am not ashamed to admit that I have worn this so many times over and over again in the last weeks while many other make-up was waiting to be tested. I just can't get over how feminine and pretty this looks. 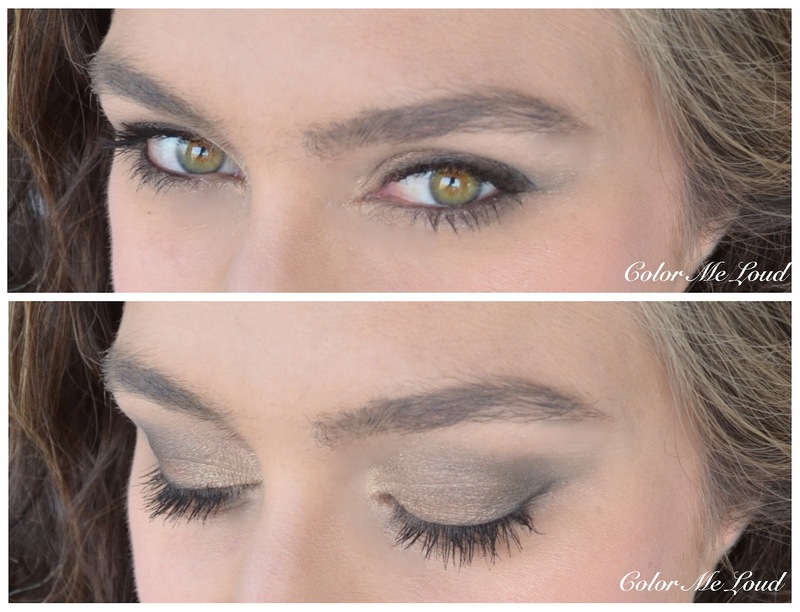 Below I combines it with the brown gel liner and some mascara. Although the deepest shade is really deep in comparison to the pink, they blend seamlessly without blending too much into each other. Suqqu Ex-06 Hanamizuki shows how beautiful Suqqu eyeshadow formula is. Everyone needs this trio, seriously! 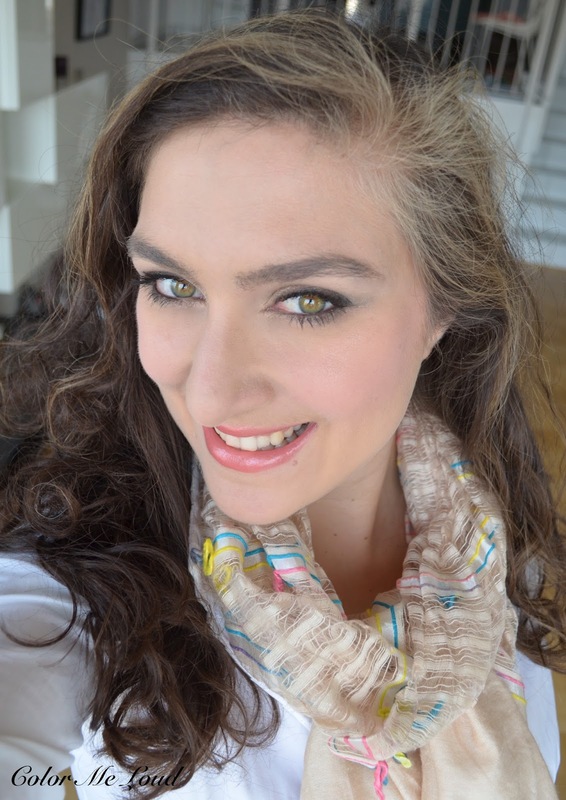 Here is the look in context, Suqqu Eye Color Palette Ex-06 Hanamizuki on eyes, Suqqu Face Colour Palette Ex-04 on face & cheeks, Bright-Up Lipstick 09 Azamibae on the lips. If you like casual everyday lipsticks, I recommend you to check out Bright-Up Lipsticks, Azamibae is my favorite. 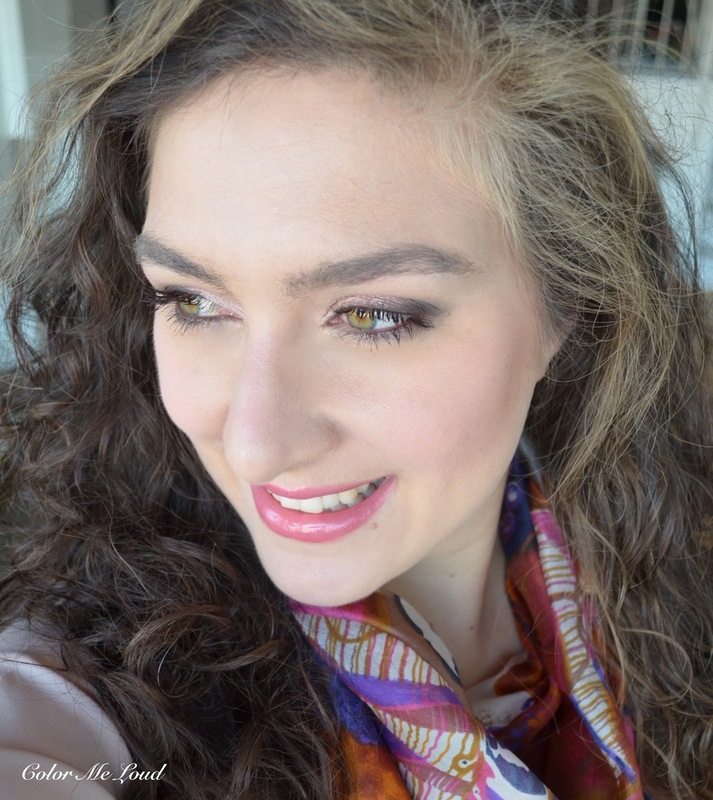 Here is a closer look to the pink harmony I am loving so much. Suqqu Eye Color Palette Ex-06 Hanamizuki must be one of my favorites from the collection together with Bright-Up Lipstick in 09 Azamibae. 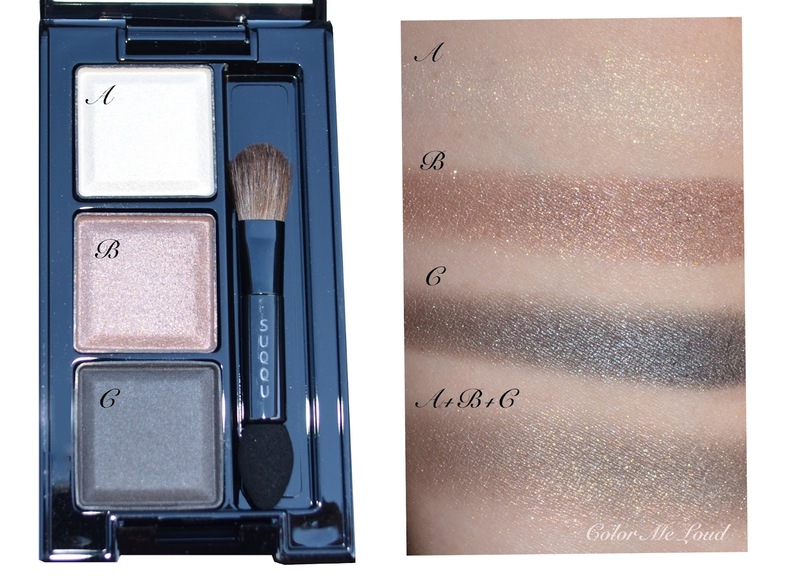 My other love is certainly Blend Color Eyeshadow Ex-28 Kinshasa which gives that icy fresh look for Spring, super pretty. 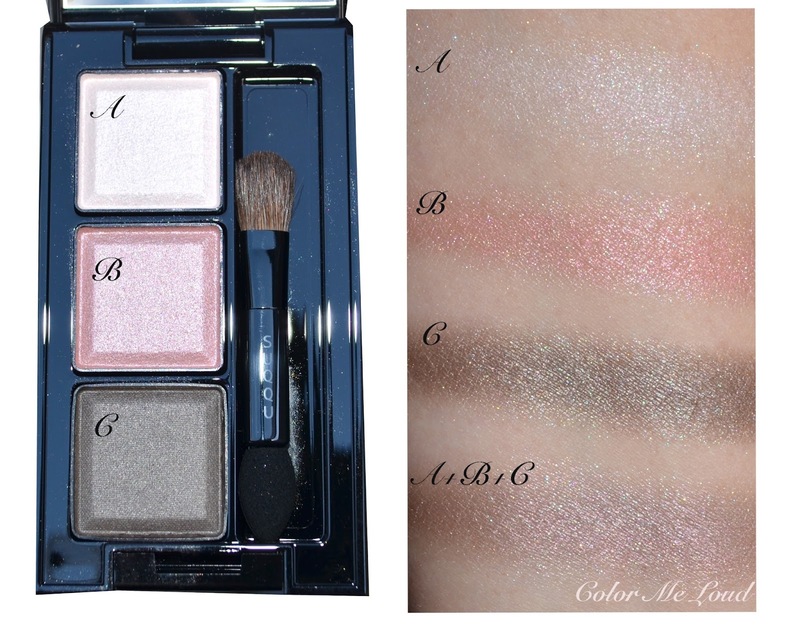 Final thoughts: Spring brings us two Suqqu limited-edition Eye Color Palettes, Ex-05 Sumichazumi is for old gold, khaki lovers, Ex-06 Hanamizuki is for those who like peachy pinks and taupes with a touch of purple. On my coloring Hanamizuki definitely wins. I am loving the Bright-Up Lipsticks to go with these. I think 08 Samidaidai goes best with Ex-05 Sumichazumi and 09 Azamibae combines beautifully with the cooler tones of Ex-06 Hanamizuki. The collection will be available this week. Suqqu is available on store at Fenwick of Bond Street, Harrods and Selfridges and online at Selfridges and Harrods. Thank you for your reviews and beautiful photos. Both trios look pretty on you but the Ex-06 is definitely the stunning one. The lipsticks are gorgeous, too. Did you also get the lip products in little jars (not sure what they're called)? I am planning on buying the Ex-28 and possibly the Ex-06. I love how it looks on you. How does the Ex-06 compare to the Autumn quad Yoihagi? From your photos I love them both. Thanks again. Yoihagi, be still my beating heart. I love that one so much, I ended up wearing it to all the special occasions. 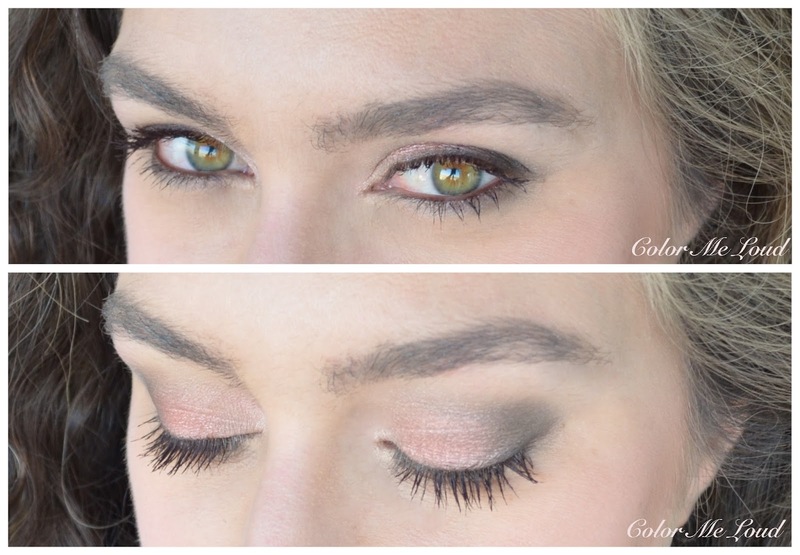 Spring Quads and Trios have softer pigment. Ex-06 is softer and fresher than Yoihagi. Yoihagi has dirtier autumn colors. If I have to choose, I would choose Yoihagi because it shows up better on my deeper eye lids. Ahhh....My Dear Husband is in Tokyo right now. I'm not sure he's going to have enough free time to have a shopping day. I thought I could pass on the Blend Colors, but Hanamizuki is calling out to me. I love your face of the day with it. I guess I need to create some screen captures and email them to him, just in case he has any free time. Oh, Suqqu! Why does your makeup have to be so beautiful and so hard to obtain? Decisions decisions :)). I'll definitely be getting Ex-28 and following your advice Yoihagi. I just have to decide whether to get the Ex-06 as well. I am very tempted but I already have so many Eyeshadows. Do I really need yet another one :). As beautiful as the lipsticks are I will pass on those. I haven't decided about the powder yet. Both look great on you, especially the 2nd Trio, love that pink! Is Suquu's formula similiar to Cle de Peau's or no? That pink trio is definitely prettier with your green eyes than the other! But still, I think you did a great job with both of them! I've not had very good experiences with the trios, although I liked last Spring's, but I think I'm going to skip these. May I ask why you say you've not had good experiences with the trios in the past? I've been considering the Ex-06 so I was just curious. Thanks. Ah, Hanamizuki looks so pretty! Sigh, I only have one Suqqu palette that my sister bought for me when she went to Thailand, but I would love to get more. I think, in this past year, I've lost a lot of excitement for new makeup releases because I keep seeing the same ol' texture, same ol' colours from Western brands being released year after year! I think it's about time I start buying more Suqqu and other Japanese brands from the internet because I do love my Shu Uemura and the couple Three and Suqqu palettes. The different finishes and textures might just be what I need to shake myself out of this makeup rut! Thanks for posting great swatches! Hi Sara, I've decided to get all three palettes including Ex-06. As I don't have any trios from SUQQU could I trouble you for a favour if you've still got the packaging, to check if the trios are free of parabens and nano ingredients? Thank you. Btw, I hope today went well and your apartment wasn't disturbed. Hi Linda, thank you for your reply. It's very helpful to know. I really like the way Hanamizuki looks on Sara and as I was worried that it may sell out on Selfridges website so I ordered it. I hope I'll like it. ;) Thanks again. what did you choose finally? did you buy ex-06? I have bought both Ex-06 and the Ex-28 quad. I think they're both beautiful. I really like them.